This beautiful stationary sofa will be a stylish addition to your traditional living room. 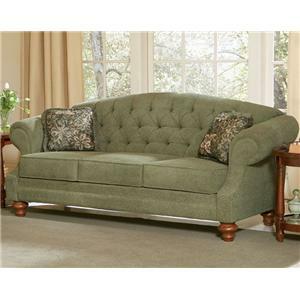 The high back cushion is button tufted, creating an elegant look. Deep welted seat cushions, and heavily padded rolled arms sit above a turned legs. 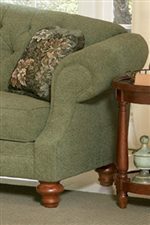 This sofa is available in multiple fabrics my special order, so you are sure to find the perfect fit for your home. The 1017 Stationary Sofa with Tufted Seat Back by Charles Schneider is available in the area from BigFurnitureWebsite. Frame Construction 1 Inch engineered hardwood with interlocking morris and tennon construction and 2” front rail.